This jacket is fitted and may run small. Most people go up 1 size if they don't have a flat stomach. 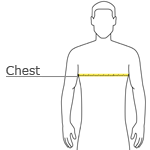 See below for chest size chart. This go-to basic jacket sheds wind and rain. Mustang pony and bars logo embroidered on front left chest with mustang text embroidered underneath. Machine wash cold. Only non-chlorine bleach when needed. Tumble dry low. Cool iron if necessary. Do not dry clean.